Stained Douglas Fur wood, with light Birch wood round stock. 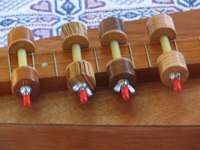 Adjustable for very low dulcimer playing to higher positions! The new hammer design creates a bigger balanced sound with less effort. 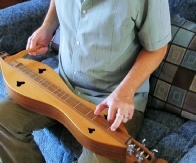 The fretted dulcimer hammer opens up a whole new way to play! Add Background, play and jam with a new sound. The new hammer is solid maple wood.